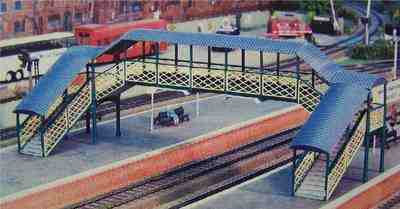 Ratio 548, Covered footbridge, modular design. This versatile kit can be put together in many diferent ways to fit onto your own particular layout, ie with/without the roof, stairs in oposite directions, platform to platform or platform to ground the decision is yours. Wide enough to span two tracks but another kit can be added to reach across three or even four tracks.